Reduce, Reuse, Recycle. This is the mantra of the modern environmentalist. But until recently, we were not faced with what ‘recycle’ actually entails. For me, up until now, ‘recycle’ meant checking the number on the bottom of my plastic, tossing it in the recycling bin, and feeling good about myself. However, when China announced in July of last year, that they would no longer be importing western waste products, we were forced to face the messiness of what really happens when we recycle. The instability of the cyclical waste economy was revealed and now countries around the world are struggling to find a solution to the immediate and long-term problems of waste management and sustainably in a world of industrializing countries. In simple terms, when trash is recycled, the materials are repurposed and used to produce more products. However, Canada, the United States, Japan, and much of Europe do not have the ability to recycle all materials. Instead, these materials were shipped to China where it was essentially imported as a raw material for manufacturing. The amount of recycling materials sent to China is staggering. In some Canadian municipalities, up to 80% of recyclables were sold to China, but Canada is not the only one. The EU exports half its recycled plastics, 85% of which goes to China. In 2016 China imported 163 million metric tons of recycling from around the world, making up an industry with almost $90 billion USD in value. China wasn’t the only country that imports recyclable materials, but it was certainly the largest, receiving 56% (by weight) of the global imports of waste plastics. Until recently, this relationship was mutually beneficial. Developed countries were able to dispose of their waste and China was able to acquire cheap materials to build more products to sell back to developed countries. However, in July 2017 China announced a ban on imports of 24 categories of recyclables and solid waste and in January of 2018 this ban went into effect. Explaining their decision, China’s Ministry of Environmental Protection stated in a notification to the WTO that: “To protect China’s environmental interests and people’s health, we urgently adjusted the imported solid waste list, and forbid the import of solid wastes that are highly polluted.” While environmental impact and public health were certainly major considerations in China’s decision to ban foreign waste imports, there are several other possible motivations including investing in their own domestic waste economy. As Adam Minter, author of Junkyard Planet: Travels in the Billion-Dollar Trash Trade, explains “China’s getting rich, and as you get rich, you throw away more stuff. As you throw away more stuff, you generate more for your own recycling.” China has its own waste to deal with and no longer needs to import from other countries. The ban is seen by some Chinese recyclers as the Chinese government attempting to hurt private-owned recycling firms that depend on imports from the West and to empower the government-owned primary material industry. Another probable motivation for the trash ban is China’s image. China no longer wants to be seen as the “trash dump” of the world. After the decision went into effect in January, countries dependent on China were left unsure of how to proceed. Backups of waste have been reported in Canada, Ireland, Germany and throughout Europe. For some cities, take Halifax, Nova Scotia, for example, this means that waste that would previously have been recycled has been shipped to landfills instead. This environmental impact is coupled with a major economic impact. “A ban on scrap imports will result in the loss of tens of thousands of jobs and closure of many recycling businesses throughout the United States,” Robin Weiner, President of the Institute of Scrap Recycling Industries (ISRI), said in a statement. Businesses that sort and then export waste in Western countries face a significant challenge with their main buyer no longer in the waste-import business. This holds true for cities where the government collects revenue from recycling as well. In Toronto, selling recycled materials accounts for $20 million dollars of revenue for the city. Derek Angove, the City of Toronto’s Director of processing and resource management for solid waste, stated that “the one thing we have experienced is that there’s an oversupply of recycling and prices are lower. Our revenues are declining,” Countries previously dependent on China are left with no way to gain profit from what was previously a robust industry, and are struggling to find ways to even dispose of recycling at all. The immediate response has been to look for alternative markets for recyclables, like Malaysia, Thailand, Indonesia and India, all of whom showed trends of increased importation of plastic scrap in 2017. However, there are two problems with simply finding countries to take China’s place as the garbage dump of the West. Firstly, these countries do not have the infrastructure to absorb the level of material that the West produces. “There may be alternative markets” stated Emmanuel Katrakis, the secretary general of the European Recycling Industries’ Confederation in Brussels “but they’re not ready today.” The second problem is that the problems that caused China to ban imported waste still exist for these countries. The environmental and health impact of imported waste caused Vietnam to stop issuing waste import permits in January of 2018 and Malaysia passed a law in 2017 that set a standard of an environmental permit for waste importers. Also, if these countries go the way of China and begin producing sizable domestic plastic and paper waste, they will likely stop needing imported waste altogether. China’s ban on imported waste and the chaos that has followed is revealing of the lack of sustainability in the recycling industry. The only way to truly move forward is to start producing less waste altogether, recyclable or otherwise. In Europe, this crisis has pushed politicians to action in terms of mitigating waste. Theresa May pledged to eliminate avoidable wastes in the next 25 years, including in her speech a call to supermarkets for plastic-free aisles. The EU plans to propose a plastic-bag tax as a direct response to China’s waste-import ban. These policies would certainly be a step in the right direction, however, it remains unclear if they would be enough, or come into practice soon enough, to fully address the issue. In Canada, British Columbia has been identified as a model of a sustainable recycling industry. Not one city in BC has faced a crisis as a result of British Columbia’s non-profit Recycle BC that handles all recycling in the state, using funding from businesses in the province that create waste through products or packaging. 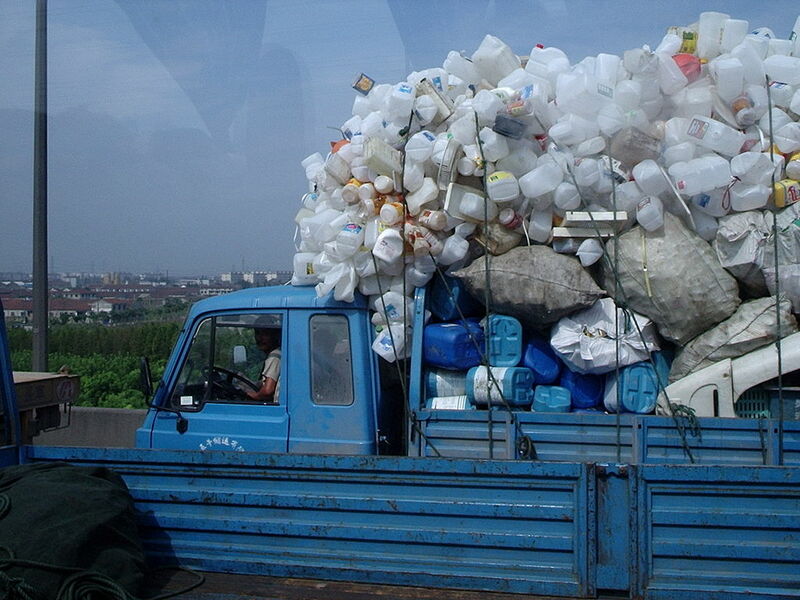 BC doesn’t rely on China to import their plastics because Recycle BC has created a system which processes provincial recycling within the province and then supplies it to local businesses – creating a sustainable cycle. Hopefully, other provinces and states will follow in BC’s footsteps and create a cleaner method of recycling. Despite instances of positive reform, there are several ways this could go from bad to worse. Firstly, if more cities go the way of Halifax and put their recycling in the landfill, or worse, the incinerator, the environmental and public health impact would be huge. Secondly, if China finds that its domestic recycling cannot fill the gap left by imported recycling, China may turn to new materials instead of recycled ones to fuel their manufacturing. As Adam Minter explains, “China still needs raw materials … and there is still some recycling that will be able to be imported, but it’s not going to be sufficient to meet their needs. So already we are seeing China turn to what are called ‘virgin’ materials.” Virgin material processing is much worse for the environment than recycled material manufacturing, and with a significantly smaller supply of recycled materials, some Chinese manufacturers have no choice but to turn to new materials. China’s decision to dramatically cut back on waste importation has left the international community struggling to move forward with both short-term and long-term solutions. What it reveals most of all is that we, as a planet, produce too much waste, both recyclable and otherwise, and that the methods we have depended upon to dispose of this waste are not sustainable. It remains unclear if global communities will rise to the challenge and use this as an opportunity to dramatically change waste management for the better, or if, faced with hard decisions around disposing of the mountains of recycling that are already piling up in cities around North America and Europe, communities will turn to far less responsible waste disposal processes, leaving us worse off than before. China is forcing us to confront our waste problem, and hopefully, we can come out the other side with a cleaner, more sustainable version of reduce, reuse, recycle. Sophia Kamps is a U2 student currently pursuing a degree in political science and art history. She specializes in American politics, international relations, and the intersection of politics and culture. When she's not writing articles or crying over schoolwork, Sophia likes to watch The Office and care for her plants.